Nina Odette Hanson — first daughter of Isaac Hanson and wife, Nikki. The oldest of the hunky all-brother boy band, Hanson, already has two sons, Everett, 7, and Monroe, 5, who, according to Hanson, 33, "are excited about being big brothers." 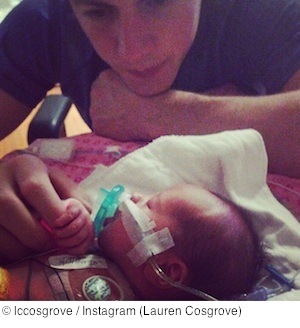 Lyla Grace, first child of Lauren Cosgrove and fiancé US Olympic hockey star, TJ Oshie. While Oshie was wowing the world in Sochi, Cosgrove watched from home. The couple knew their daughter would soon be born with a life-threatening birth defect called gastroschisis that would require immediate surgery once she was born. Baby Lyla is said to be recovering beautifully, eating normally, and her adoring parents are anxious to take her home any day now. Eloise McCue Show, first child of acting couple Katherine LaNassa, 47, and hubby, Grant Show, 52. Show told People magazine in August that the couple had babies on the brain, that it was a little difficult thanks to their ages, but they were busy with "practice, practice, practice." LaNassa has a 23-year-old son from her marriage to Dennis Hopper. Carl Leo, first child of reality TV star Evelyn Lozado, 38, and fiancé, Carl Crawford, 32, an outfielder for the Los Angeles Dodgers. Lozado has a daughter from a previous relationship. Noah Murphy — first child of Tori and Daniel Murphy, 29, second baseman for the New York Mets. Murphy drew the ire of a couple of on-air baseball commentators when he took league-sanctioned paternity leave to spend three days with his wife while she was recovering from C-section childbirth rather than play ball. The couple named their son Noah in reference to the biblical story, not Murphy's teammate, Noah Syndergaard, Murphy explains jokingly. James Hamilton McDonough — son of Ruvé Robinson and actor Neal McDonough. Welcoming baby James home are one brother and three sisters. Actress Megan Hilty, 33, and husband Brian Gallagher. Hilty claims to be craving "sushi, tuna fish sandwiches, coffee, and champagne," all of which she says she can't have right now. Rascal Flatts' guitarist Joe Don Rooney and wife Tiffany Fallon expect their third child in late summer. Fallon was the 2005 Playmate of the Year. Mad Men's Kevin Rahm and his wife, Amy Lonkar, a cardiothoracic surgeon, are expecting a daughter in September. Musician James Durbin and wife, Heidi, are expecting baby #2 in November. Durbin was a finalist in the 10th season of American Idol. Carson Daly and his food-blogger fiancée, Siri Pinter, are expecting their third child in August. Actress, model, and former professional wrestler Stacy Keibler and her husband, Jared Pobre, are expecting their first child sometime this summer. Source: "Moms & Babies." People. Time Inc. Apr 7, 2014. Web. Apr 7, 2014.